Today I'm in Liverpool city for 1 day intensive makeup training at the amazing Kate Hayes Make Up Academy. I'm really excited to to learn some world class techniques from master make-up artists in such a great city. 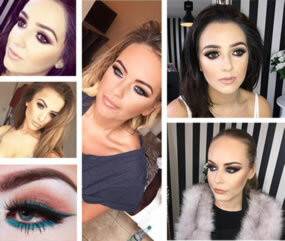 Kate uses all the best makeup, HD Brows, Illamasqua and MAC Makeup to create her looks and classes cover everything from half smokes to full smokes, natural contour, dramatic contour, glitter application and expert bridal makeup using Katie’s full kit. Posted on August 8, 2016 by Panache Bridal and filed under Beauty and tagged training make up liverpool smokes bridal dramatic cosmetics. Panache Bridal is privileged to have a beauty salon on site where we can offer a wide range of beauty treatments including bridal make-up to help prepare you in the lead up to your wedding day. We try to offer everything you might need to ensure you are looking and feeling fantastic on the day. Why not call us to discuss your requirements or visit our beauty site Panache Beauty Salon for more information on the full range of treatments available. Here are a few of our more popular treatments. The Skinbreeze Orbital system incorporates the latest pain free treatment technologies which can be combined and tailored to tackle a variety of skin concerns ranging from acne and blemishes to wrinkles and anti-ageing. A course of treatments is recommended if you have a skin complaint that you wish to treat before your wedding day or you can choose to have a prior treatment monthly to ensure your skin is at its best in time for your Wedding Day. This is vital to ensure the flawless make-up look. PRO-TIP: A personal consultation will advise the best treatment for you, call us to discuss the different options. Almost every bride wants their make-up to look as natural and flawless as possible on their wedding day without feeling overwhelmed or uncomfortable with thick, heavy make-up. PRO-TIP: Remember you'll want your make-up to last all day and into the evening. Airbase is sprayed on with a very small airbrush, it feels just like air when applied and is weightless. The product is tiny beads of silicone which sit on the surface of the skin giving that flawless look. It is not absorbed into the skin's pores like other foundations and therefore does not break-up or slide off! Coverage can be as light or heavy as you wish whilst still feeling light and weightless on the skin. It is High Definition make-up therefore is excellent for photographs and is used frequently by professional make-up artists who work with TV productions such as Loose Women, This Morning, Dancing On Ice, Strictly Come Dancing and X Factor; all praise Airbase for it's staying power and durability. All brides-to-be will receive a trial and consultation in the Beauty Salon prior to your Wedding Day. On your Wedding Day we will travel to you or your chosen venue. Modest additional charges may apply depending on distance. Get well manicured hands and nails for their Wedding Day. This will definitely be a shot that your photographer (as well as your guests) will take wishing to admire your new shiny, sparkling wedding rings. PRO-TIP: Great nails really stand out in photographs of the happy couple's new wedding rings. We use Crystal Nails Titanium Hard Gel for all nail extensions. This product is outstanding and can cover almost all imperfections. It also has perfect adhesion with virtually no lifting so you can be confident that your nails will last through to your honeymoon still intact. Do not underestimate the power of your brows! It's a unique treatment for creating perfectly well-groomed, high definition eyebrows. The HD Brows procedure transforms the way you look and more importantly, how you feel. Unlike other eyebrow treatments that use a 'one shape fits all' technique, HD Brows stylists assess face shape and colouring before creating a bespoke brow, tailored exclusively for the client. PRO-TIP: Good looking brows are important on HIM as well as her. Tidy well-groomed brows are an absolute must regardless of how fair they are. Not only do your brows frame your face, it opens up your eye area and can make you look younger. This is fundamental to your make-up application. If you have random stray hairs around your brows the make-up will sit on top emphasising them. Please Note: Patch test required prior to treatment. Call us to book an appointment. We offer various eyelash treatments from Lash Tint, Lash Lift or Eyelash Extensions. Please Note: Patch test required prior to treatments. Call us to book an appointment. If you want a natural look why not opt for and Eyelash Tint. This will give more definition of your lashes and can give the appearance of longer lashes. Perfect if you have straight eyelashes . This treatment will lift and curl your lashes really opening the eye area. Add a lash tint to this treatment for maximum impact. Lasts approx 4-6 weeks. Mascara can also be worn and removed with this treatment. If you prefer a more false lash look with extra length then this is the perfect treatment for you. Nouveau lashes are individually applied to your own lashes giving a thicker fuller longer lash look. A level of care is required when wearing express lashes to ensure longevity of the treatment and care for your own natural lashes. Although not the most enjoyable treatment a necessary one none the less! We all want to be hair free, well groomed and silky smooth for your Wedding Day and Honeymoon. Waxing gives the longest hair free results and takes away the laborious inconvenience of shaving. Please call us to chat about any of the treatments listed here or to book an appointment and we encourage you to visit our beauty salon website Panache Beauty Salon for information on the full range of treatments available. Posted on November 12, 2015 by Panache Bridal and filed under Beauty and tagged make up skinbreeze microdermabrasion facial eyebrows foundation gel nails brows shaping shaped lashes eyelashes tint tinting extensions waxing trimming tanning. Every bride has the perfect wedding picture in her mind, and probably has done ever since she was a little girl. But even when you think you’ve got everything sorted for your big day, it’s always useful to re-address some of the most important aspects of your day, your own comfort! That’s why we’ve put together a few bridal comfort tips so you can ensure your well-planned big day can be enjoyed by everyone, especially you! Comfort tip #1 - Don’t underestimate the importance of wearing the correct underwear. You’ll have spent time, effort and no doubt a lot of money seeking your perfect wedding dress. You want to look stunning on your Wedding Day and will probably have been on a healthy eating plan, hitting the gym and been concentrating on your skincare regime in the lead up to your Wedding Day. Ensuring you are wearing the correct supportive underwear is equally important. You want that hourglass silhouette so it is vital that you are wearing underwear to lift, push and shape your bust where you want it to be (regardless of size) and bottoms that will shape, flatten and are probably seam free. I understand that this is probably not what you had in mind for your wedding night and there are some beautiful sets of wedding underwear available to buy. Most of these (depending on the dress) are not suitable to be worn under your dress and can cause lumps and bumps in your dress so ideally you are looking for something quite plain and smooth so that it does not show through your dress. Keep your special set to change into later. PRO-TIP: It is vital to take your wedding dress underwear to your dress fitting. Comfort tip #2 - Do I need a petticoat under my dress? Unless you are wearing a light sheath style dress I would almost always recommend wearing a petticoat. Petticoats come in various styles to suit most styles of dress. A Petticoat will smooth your silhouette, hold your dress away from your legs and feet making your dress more comfortable to wear and will be easier to walk in. It will also help your dress display as it should, making it easier for your bridesmaids and photographer to titivate your dress for photographs. PRO-TIP: If you have one, it is vital to take your petticoat to your dress fitting. Call us to discuss different options. Comfy doesn’t have to mean old-fashioned or ugly. There are plenty of high-fashion shoe brands exuding bridal comfort and elegance all rolled into one including Benjamin Adams, Rainbow Club and Pink. These bridal brands have constructed their shoes with comfort in mind. They know that these shoes are going to be on your feet for a very long time and most have padding at the ball of the foot and heel area. PRO-TIP: Choose a heel height you know you will be able to cope with all day. If you have a floor length gown you do not want to be removing your shoes, wearing flip flops or even Converse later in the evening as your dress will be far too long and will act as a big mop on the dancefloor soaking up spilt drinks, it will be stood on most likely torn. It is vital to take your wedding shoes to your dress fitting. All dresses will require some sort of alteration to ensure the dress is fitting your body perfectly. A common concern I hear from most brides is that they do not want a strapless dress as they will be hauling it up at the bust all day. Whilst this might be a common sight, this is poor dress fitting. If you have had your dress fitted by a good professional dress maker, your dress will fit you like a glove and there will be no risk of it falling down and no gap between the bust and the dress. PRO-TIP: The slightest tweak can make all the difference. If you have questions about any of the tips above we welcome all enquiries so please do not be afraid to call us for a chat or email your questions. Posted on October 23, 2015 by Panache Bridal and filed under Beauty and tagged tips trick comfort underwear dress fitting alterations petticoat shoes heels.